Proper cam selection is critical to the performance of your XL engine. At HAMMER PERFORMANCE we have many years experience building XL engines and we've used literally every XL cam available at one time or another. We're proud to offer on this page the grinds that we've had the best success with, and that work the best with our head work. Here's a quick guide for cam selection. The first spec to look at when selecting your cams is the intake close timing. What happens is that the piston is well on it's way up on the compression stroke before the intake valve closes. This is done to maximize cylinder fill, as the incoming fuel has inertia and the cylinder continues to fill for a little while even after the piston has started coming up. But the amount of time the cylinder fills stays pretty constant regardless of the rpm of the engine. So as the engine turns higher and higher rpm's, ideally you'd like to move the intake close timing out farther and farther. Since these motors don't have variable valve timing, you have to pick an intake close timing event based on the rpm that matters most to you. Street grinds typically close the intake valve anywhere from 35 to 55 degrees after bottom dead center (ABDC) Race grinds tend to close it anywhere from 55 to 70 degrees ABDC. 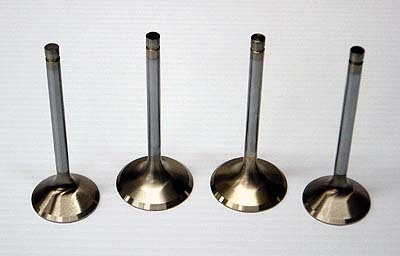 One other note on intake close timing: the later you close it, the higher compression ratio you need, since no compression takes place until the valve is closed. A high compression ratio with early intake close timing is a recipe for detonation. Likewise a low compression ratio with late intake close timing will sap power, especially on the bottom end. Download a copy of our Static and Corrected Compression Ratio Calculator to help decide how much compression you need with a specific set of cams. The next important spec to look at is the overlap. Overlap is the sum of two of the timing numbers, exhaust close and intake open. Add these two numbers together. Overlap is the number of crankshaft degrees in which both valves are open at the same time. Why is this so critical? It happens as the exhaust cycle is finishing and the intake cycle is beginning, with the piston passing through top dead center. While both valves are open, the exhaust and intake are effectively connected together. If the exhaust pulls right then, it'll get the next intake charge moving before the piston even starts pulling on it, giving the cylinder fill a huge head start. But if the exhaust pushes back right then, it really messes up the cylinder fill and fuel mixture (we call it a "reversion"). So in a nutshell, more overlap turns over more control of your engine's powerband to the pipe. When using cams with a lot of overlap, your torque curve will essentially be a map of how the pipe behaves at different rpm's. Overlap with a good pipe really helps you. Overlap with a bad pipe really hurts you. If you've got a pipe with the sound or looks that you like, but it doesn't work well at the rpm you like to ride, choose cams with less overlap. TDC lift figures are also very important, and closely related to overlap. These numbers tell how much the valves are open as the piston passes through top dead center during the overlap period. Why is this important? In a word, clearance. Contrary to popular misconception, valve to piston clearance has nothing to do with maximum lift, because maximum lift always occurs with the piston well down the bore. It's the valve lift as the piston passes through TDC on overlap that creates clearance problems. So if you're looking at cams with high TDC lift figures, plan on claying your motor to check your clearance. High TDC lift figures can also cause issues with valve to valve clearance, but if we set up your heads and you told us what cams you're using, we've checked it and set it for you. 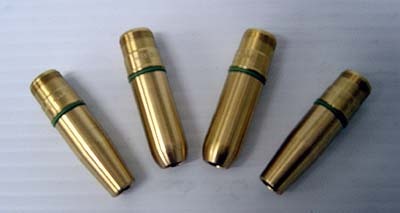 Maximum valve lift should be chosen with an eye on the head's flow numbers. Many stock ports will "nose over", flow-wise, at lifts well under .500". That means the port is flowing all it can, and opening the valve farther doesn't make it flow more. After the heads have been properly prepared, however, this changes dramatically. So consult your head porter about how much lift your heads can make use of. If you're using stock heads, there's really not much point in going past about .500 lift with even the best factory heads. One more point to consider: high maximum lift doesn't cause issues with valve to piston clearance, but there are a host of other clearance issues it can cause. With a high lift cam grind, the cam lobes may want to contact the underside of the tappet bosses and/or the pinion race, the tappets may want to run into their anti-rotation pins, rocker arms may want to contact the rocker box tops, springs may bottom out and bind, or your retainers might run into your valve guide seals. On top of that, high lifts put a lot of side loading on the valves which causes guide wear. The bottom line is that there's no benefit and many drawbacks to running more lift than your heads can make use of. HAMMER Jackhammer 570 - Bolt-in grind for 2004-up 1200 models. Designed to give a boost in mid range and top end over the factory "W" cams with no loss in bottom end power. Ideal for the stock 9.7:1 compression ratio but can be used up to 10:1 with careful tuning. Also works well on SMASH prepared 883 heads. Smaller than stock base circle to simplify installation. SE Bolt-Ins/Andrews N4 - Our favorite bolt-in grind for the 03 & older XL's. Original equipment on many Buells. Ideal compression ratio of 9.5:1 to 10.5:1. Broad powerband and can pull to 6800rpm with good heads and pipe. Easy on the valvetrain. An excellent match for our Impact head porting service on this generation of heads. 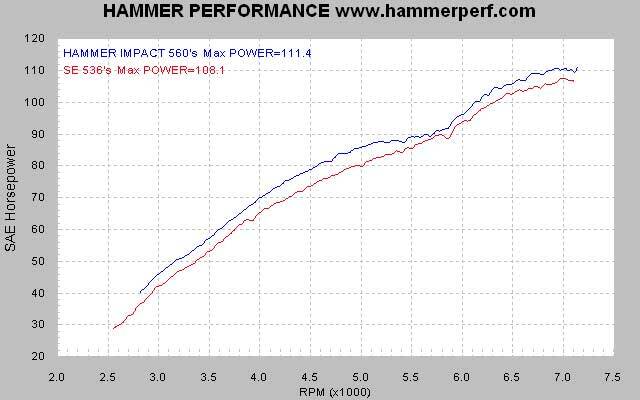 HAMMER Impact 560 - An amazingly versatile grind. Bolt-in for the late model 1200's. Proven to add as much as 14hp to a stage 1 EFI 1200. Also a part of the 100+hp 883-1250 conversion package. Similar intake timing as the N4 above but with additional lift to take advantage of the better hardware in the later heads and more overlap to take advantage of good exhaust systems. Ideal compression ratio of 10:1 to 10.5:1. Broad powerband and can pull to 7400rpm	with good heads and pipe. Easy on the valvetrain and designed for quiet operation. Smaller than stock base circle to simplify installation. An excellent match for our Impact head porting service on the latest generation of heads. Screamin Eagle .536 - Good hot street cam. Ideal compression ratio of 10:1 to 11:1. Keeps costs down because they do not require a large cast of supporting components. Watch the valve to piston clearance on the exhaust side when using stock pistons or pistons with smallish valve pockets. Works with stock late model beehive spring pack. Excellent choice for Smash head service with 7mm option. Broad powerband up to 7000+ rpm. Screamin Eagle .575 - More top end than the SE .536, but needs better springs. 10:1 to 11:1 is where you want the compression ratio. Easy on the valvetrain. Use pistons with large valve pockets. Small base circle to avoid cam box and tappet pin clearance issues. Excellent match for Smash head service with heavy duty valvetrain pieces. Broad powerband up to 7000+ rpm. Red Shift 585 - Great street cam for 88 inchers or race 1250's. 10.5:1 to 12:1 ideal compression ratio. Easy on the valvetrain. Low TDC lifts for easy setup. Cam box clearancing and long tappet flats are generally required, as well as lobe clearancing for pinion race. Excellent match for Smash or Sledge head service with heavy duty valvetrain pieces. Broad powerband up to 7400+ rpm. HAMMER Crush 600 - Great street cam for 88 inchers or hot 1250's. 10.5:1 to 11:1 ideal compression ratio. Easy on the valvetrain and designed for quiet operation. Requires pistons with large valve pockets. Small base circle for easy installation. Excellent match for CRUSH head service but will work well with Smash or Sledge as well. Designed to be compatible with our PAC Alloy beehive spring pack when used with 7mm stems or our .650 lift Sledge Hammer spring pack with 5/16" stems. 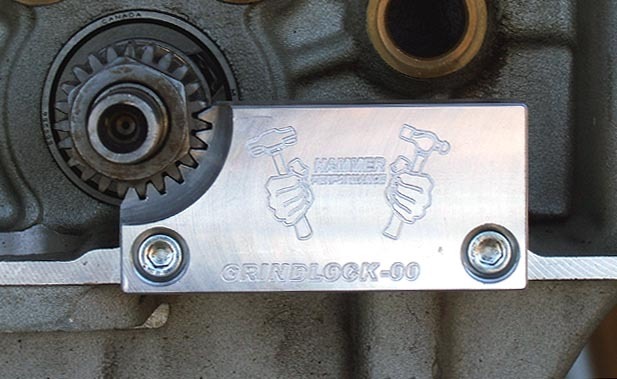 HAMMER Sledge 660 - High lift grind for hot street or race applications in 88-100ci engines. Works best in big valve heads to take advantage of the lift. 10.5.:1 to 12:1 ideal compression ratio. Easy on the valvetrain. A lot of overlap makes it sensitive to the exhaust system. Roller rockers mandatory. Check valve to piston carefully. Cam box clearancing and long tappet flats are required, as well as lobe clearancing for pinion race on most motors. Excellent match for Sledge head service on street applications. Broad powerband up to 7200+ rpm. Red Shift 729V2 - Race grind for 88 inches and bigger. Works best in big valve heads to take advantage of the lift. 12.:1 to 14:1 ideal compression ratio. A lot of overlap makes it sensitive to the exhaust system. Check valve to piston carefully. Roller rockers required. Cam box clearancing and long tappet flats are absolutely required, as well as lobe clearancing for pinion race on most motors. Excellent match for Sledge head service on race applications. Broad powerband up to 7500+ rpm. A note on pinion gears: Starting in 2000, HD went to a new, finer pitch on the pinion gear and the matching drive gear on the #2 cam. This change was then made on all the gear connections for 2001. Note that some cam grinds are only available in one series or the other. 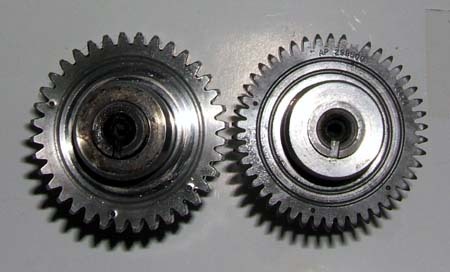 To retrofit 2000-up cams to 1991-1999 motors, update the pinion gear (available below). Likewise, to put 1991-1999 cams into 2000-Up models, back date the pinion gear. Alternatively, if you have a press, read this for instructions on how to move your drive gear from one set of cams to another. "Bolt-In" Cams: "Bolt-In" means that the cam manufacturer believes the cams will go into your motor with the rest of the parts all stock, and generally without any clearancing work as well. In other words, they install just like a set of the original cams. While bolt-in cams are convenient, if you restrict yourself to bolt-in cams you're leaving power on the table, particularly if you've done head work. Head porting allows the head to flow more air at lifts beyond what the stock cams provide. Bolt-in cams also typically don't have a lot of overlap, to keep TDC lifts and the associated issues down, so they generally can't reap the benefits of a high overlap grind the area of exhaust augmented intake flow. 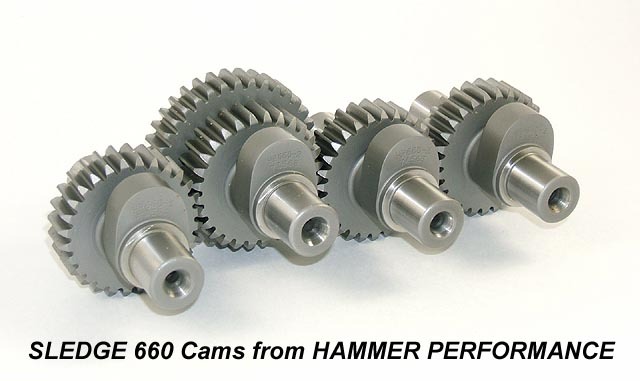 HAMMER PERFORMANCE is proud to announce cams of our own design. We put a great deal of work into coming up with these cams, paying particular attention to torque and power production, ease of installation, and quiet operation. Although they're optimized for HAMMER PERFORMANCE CNC Head Porting, they work well in other applications too. See the description above for each grind. Click the thumbnails below for some of the dyno results from these cams. Note: the SLEDGE 660 cams are for installation in 1991-2005 motors only. 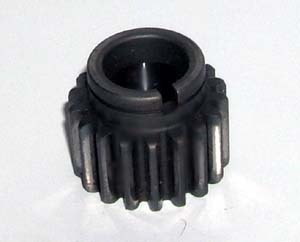 Installation into a 2000-2005 motor requires backdating the pinion gear to the coarse tooth pitch, available below. Red Shift Cams have a unique feature: they can be made right on your existing cam gears. This is especially beneficial in 1991-1999 models which came from the factory with fitted cams to reduce noise. By having Red Shift lobes put on your cams, you maintain that factory fit and gear quietness. Screamin Eagle makes some of our favorite cams for street use. They are easy on the valvetrain and work well at streetable compression ratios. Bob Wood is known for his high lift, narrow grinds, which tends to deliver a broad power band. Extensive head work is really needed to take advantage of big lifts. We've had particularly good success with the W68S in race and very hot street applications. Updating or backdating cams in your XL engine? 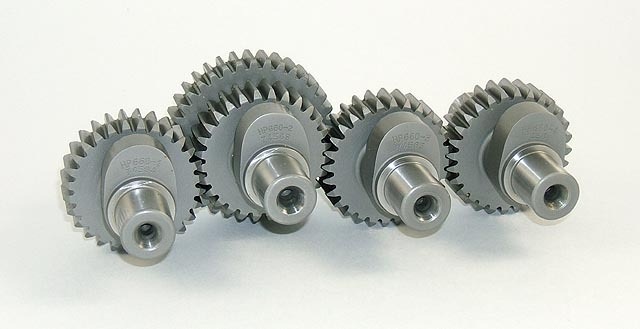 Be sure to match your pinion gear to your cams. We carry both the 1991-1999 style in 5 different sizes as well as the 2000-Up style "high contact ratio". Either style will bolt right into a 1991-present engine, which allows you to use late model cams in earlier engines and vice-versa. We also carry pinion gears for 1986-1987 models. These gears are splined and will not fit the pinion shaft of any other years. Pinion gears for 1988-1990 models are no longer available, sorry. If you're not sure what size to use, get the yellow (smallest) gear. A little clatter won't hurt anything but gears that are too tight will cause localized tooth heating and failure. Tech Tip: Never tighten or loosen the pinion nut by holding the flywheel assembly on the opposite side, by any method, including holding the rear brake with the trans in gear. The flywheel assembly is not made to hold torque twisting through it's crankpin and you can easily knock it out of true, necessitating a full tear down to repair. Instead, use one of our pinion locking tools to properly hold the pinion shaft in place. Sportster and Buell engines are notorious for wearing the oil pump drive gear on the pinion shaft. Pinion shaft runout causes this. HAMMER PERFORMANCE has the solution, though, a bronze oil pump drive gear that greatly reduces wear in this critical area. Check your stock drive gear; if the teeth are getting sharp on one side, it's time to get one of these. If you're into the cam box anyway for a cam change, it's cheap insurance. If you're changing the pinion gear and/or the oil pump drive gear, you need this tool! If you hold the crank still from the other side of the assembly - the primary side, or by putting the bike in gear and holding the brake - you apply twisting force through the crank pin, and the crank pin is not designed to resist much twisting force. You run the very real risk of knocking the crank out of true, which requires a full tear-down to fix. Don't take the risk, get yourself one of our exclusive Grindlock pinion locking tools. We work on these bikes all the time, and frankly the other offerings on the market for this function frustrated us with weak teeth that liked to push away from the pinion gear. The Grindlock design solves that problem. 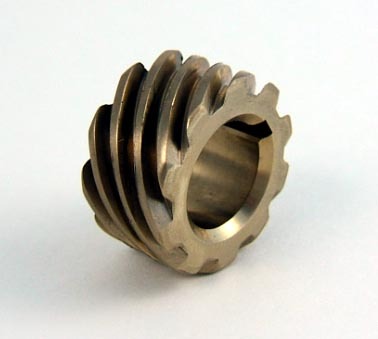 It also engages for the full depth of the pinion gear for maximum strength. Click Here for Instructions on Using this Tool. It's not always obvious exactly how it goes onto the gear and some people mistakenly assume we sent them the wrong tool or it's somehow defective. The instructions clear this up. High lift cams and high rpm's place special demands on your lifters. At HAMMER PERFORMANCE, we carry quality lifters from S&S. For most applications, we prefer the quality lifters from S&S. They've proven to be reliable and quiet in operation. Some versions are available with or without travel limiters installed (what S&S calls "HL2T"). Travel limiters can help in cases where you're losing control of the valvetrain at high rpm, and they can also help prevent hard starting by preventing lifter bleed down when the motor is sitting. However, travel limiters also require the expense and hassle and extra weight/reduced strength of adjustable pushrods, and if you have good control of the valvetrain via proper cam design and spring pressures, the limiters really aren't needed. So for most applications, we recommend you buy them without the limiters. These lifters come in two different versions, "Premium" and "High Performance" The Premiums fit 00+ models only, and these are literally the quietest lifters we've ever come across. So if you have a 2000+ model and you want quietest lifters you can buy and you're willing to pay the premium price, these are your lifters. The High Performance versions are available for all Evolution XL's. Larger inner bearing race reduces stresses to increase axle, bearing and roller life. The S&S inner bearing race is .123" larger in diameter than the "raceless" roller axles currently used by some manufacturers. Improved inner race-roller design allows use of more and larger bearings to increase load – carrying surface area, further reducing stress and wear in the critical roller area. Strong, stiff pushrods are essential in a high performance engine. Sledge Hammer pushrods are the ultimate in heavy duty, featuring .065" or .083" wall heat treated chrome moly construction and "Mae West" ends for high lift cams. Available in adjustable or non-adjustable styles. If you're planning to run more than 240lbs of valve spring seat pressure, choose the .083" wall pushrods. This much pressure is really only for all-out race motors though. High performance street applications and many race applications will be better off with the .065" wall pushrods. Tip: a non-adjustable pushrod is stronger than an adjustable pushrod at a given weight. Ideally you should always use a non-adjustable pushrod when using standard hydraulic lifters and use adjustable pushrods when using HydroSolid or full solid lifters. Read our Tech Tips Article on Pushrod Length for more information. We stock fixed length pushrods in a length that's .050" shorter than stock because this is a typical value after head decking and optimizing squish clearance through thinner gaskets. However, if you need some other length, no problem, we custom make pushrods to your specifications as well. Don't put up with cheap, leaky collapsible cover kits! Our kits use VW style conical seals at the base to ensure a leak-free connection. 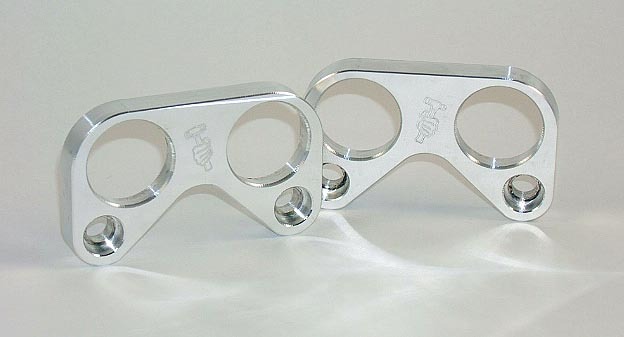 The bases themselves are CNC machined from billet aluminum and look as well as they work. 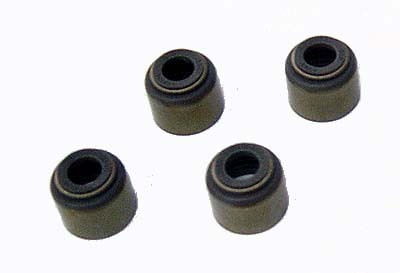 Note: Kits for 04-Up models utilize the stock pushrod bases and seal system. The stock lower pushrod tube retainer on a 1991-2003 Sportster is a cheapo piece of pot metal that bends and distorts, causing leaks. 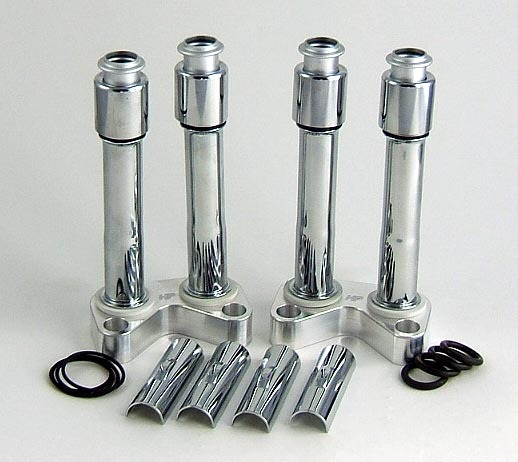 Replace yours with our Billet Base Kit to solve this problem. They look great, too! Precision CNC machined in-house out of T6061 billet aluminum. 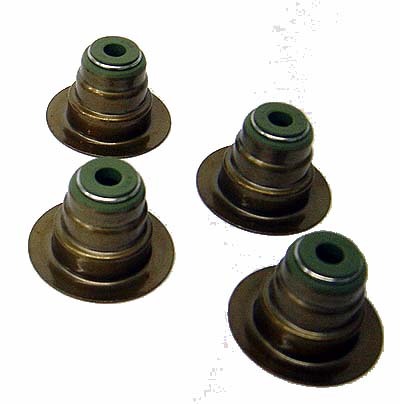 Each kit comes with two bases, the upper o-rings, the lower seals, and four stainless steel screws. Remove the roll pins in the case deck that are used to align the factory pot-metal o-rings. You can just pull them out with a pair of pliers, they come out easily. Make sure the case deck is clean and free of debris or scratches. Clean any grease or oil residue from the underside of the billet base. This is especially important in the areas where the seal will be contacting it. Use brake parts cleaner or a similar solvent and wipe with a paper towel. Likewise clean the seal in the same manner in all areas where it will contact the billet base. The idea here is to have everything squeaky clean so that absolutely nothing that will make it easier for the seals to slide out of the base. Put two seals into position in the underside of a billet base. Some people even put a few drops of super glue onto each seal to help hold them in place in the base, but this generally isn't necessary if you've got both squeaky clean. Now that the seals are in place in the underside of the base, lightly grease the inside of each seal (the area that will contact the pushrod cover), being careful not to get any grease anywhere else on the seal or base. So in other words, you want the seal squeaky clean everywhere it contacts the billet base, but lubricated where it will contact the pushrod cover. Carefully slide the base/seal assembly over the tops of the pushrod covers, down the covers, down over the thick part of the covers, and down to about an inch from the bottom. Make sure the seals are still in place in the underside of the billet base. Carefully insert the tops of the pushrod covers up into the pockets in the underside of the head, through the o-rings which are already sitting in their pockets. Swing the bottom of the assembly into place over the lifters. Push the base down onto the case deck and HOLD PRESSURE ON THE BASE. WITHOUT RELEASING THE PRESSURE ON THE BASE, install both screws and snug them down. Once they're snugged down you can remove the pressure on the base and finish tightening the screws. The key here is to never let the seal pop out of the bottom of the billet base. If it pops out during this process, it'll get sandwiched between the billet base and the case deck and it'll leak for sure. But if it stays in place, it'll seal fine. Repeat the process for the other cylinder. At HAMMER PERFORMANCE, we've seen just about every brand of roller rocker arms have a failure at one time or another, except for one in particular: S&S! So of course, those are the ones we carry! These rockers are forged from 8620 steel allow, heat treated and shot peened. They use 3/4" long bushings instead of the 1/2" bushings found in other rocker arms. 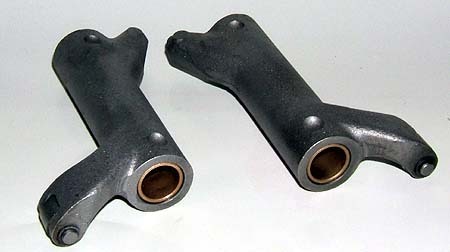 The net result is the finest set of rocker arms on the market. We've subjected these rockers to some extreme abuse in our Bonneville motors, with spring pressures north of 270lbs on the seat, .785 lift cams, and 7500rpm, for miles at a time, over and over, and we've yet to break one. We highly recommend these roller rockers for any application with valve lifts over .575 and/or spring pressures greater than 180lbs on the seat. Available in stock 1.625 ratio or high lift 1.725 ratio. Note that high ratio rockers require proper setup of valvetrain geometry, they are not a bolt-on. 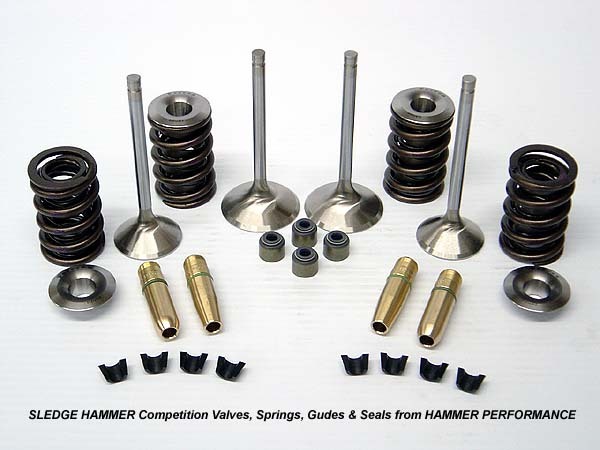 The Sledge Hammer series of valvetrain components is our heavy-duty line. These are the parts that can take the extreme abuse of racing, and they're recommended for hot street applications as well. These valves were developed for the most extreme applications in NASCAR and other race venues where durability is the name of the game. They can withstand the punishment of high rpm, multiple stages of nitrous, turbocharged, and even blown fuel applications. 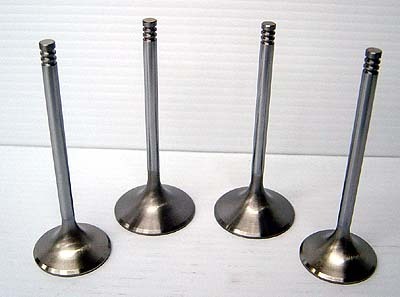 We use these same valves in our 200+mph nitro burning Bonneville race bike. You simply cannot buy a better valve for your Harley Davidson performance engine. All valves use the most advanced stainless alloy and are swirl polished for maximum flow. 5/16" Stems. 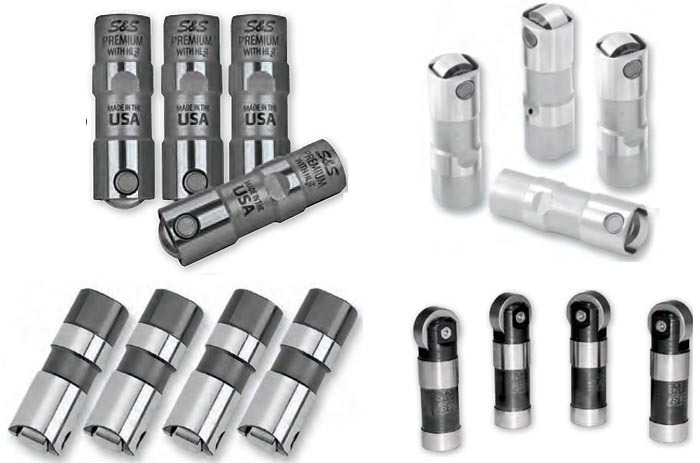 Sledge Hammer valve springs are manufactured on state-of-the-art equipment out of the finest grade chrome silicon steel. 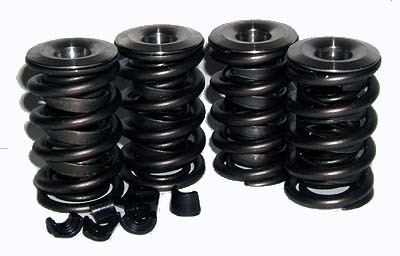 They are then heat treated and stress relieved, which dramatically improves valve spring life. All springs are subject to strict quality screenings including cycle testing to ensure consistency from batch to batch. The bottom line is that these springs provide the stability needed for high lift, high rpm applications and the durability you need for years of trouble free service. We use these springs in our all-out race motors as well as our hot street motors. Each kit includes four springs, four titanium retainers, eight 10 degree valve locks, and four spring seat locaters. Note: HAMMER PERFORMANCE recommends using only new keepers whenever a cylinder head is assembled. Equally important to the guide is the guide seal itself. AV&V viton guide seals resist temperatures 50 degrees higher than most viton seals. These seals work great and eliminate one more potential source of issues. That's the kind of parts we like to use! We offer 5/16 stem diameter guide seals both in the .531 diameter to match the guides we sell, as well as in the .421 diameter to fit the stock guides as found on 86-03 XL's, 99-04 Twin Cams, and all Evo Big Twins. 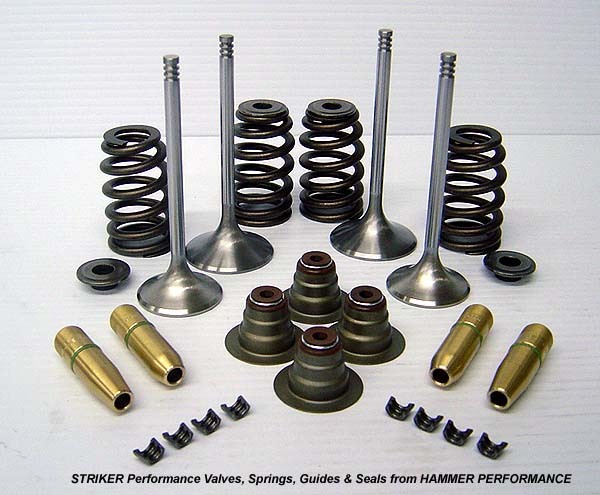 The Striker series of valvetrain components is for street performance applications. They feature ultra light weight 7mm stem valves and beehive springs. These top quality valves feature the same advanced alloys as out Sledge Hammer valves above, but are made with ultra lightweight 7mm stems. Strong, durable, and high flowing, these valves are perfectly suited to street performance applications with up to .600 valve lift and 175lbs spring pressure on the seat. For more demanding applications, use Sledge Hammer valves. All of the 7mm Stem Striker valves below have triple grooves compatible with factory keepers and retainers, except part numbers F0320, F0320M, and F0318 which require keepers K10062 sold below. Beehive springs offer certain advantages over conventional dual or triple spring assemblies, particularly in the area of reduced weight at the top end (which has the most movement) and improved harmonics. They also eliminate the need for rocker box clearancing for the springs in HD applications. The downside to a beehive is that for a given combination of seat pressure and installed height, less travel is available. Essentially, since there's only one spring, the spring wire has to be made thicker to achieve a given seat pressure, and that sacrifices travel. Therefore, in HD applications the beehive style springs are best suited for moderate lift and pressure applications. This makes them a perfect match for 7mm stem valves. Our base level beehive spring is very well priced and has been proven suitable for most cam grinds up to .550 lift and rpm's up to 6900. This spring pack uses lightweight steel retainers. 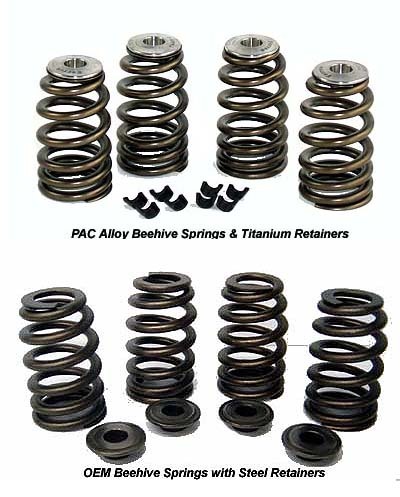 For higher lifts and rpm we also offer a high end beehive spring pack made from premium quality PAC Alloy that's been heat treated, stress relieved, multi-stage shot peened, and nitrided. These springs have the highest level of fatigue resistance available and are suitable for the toughest endurance racing applications. They work terrific in street bikes as well. They come complete with Titanium retainers. Both kits are available with either triple groove keepers (locks) or single groove keepers, choose the keepers to match your valves. Both styles of keepers are compatible with the factory 7mm retainers as well. The springs are all designed to work with the factory style 7mm guide seal/locater assembly. Up to .550 Lift 130lbs. @1.850"
The only real difference between these and the 5/16 pieces, other than the stem diameter, is the way the top is done. These guides use a .562" diameter top like the factory guides on 2004-Up XL's and 2005-Up Twin Cams, which means the seals for these guides are fully compatible with the stock guides as well. The 7mm stem guide seals feature the same high-temperature viton material found on the 5/16 stem guide seals. They are also compatible with both the AV&V guides above as well as the OEM guides. This larger .562 i.d. 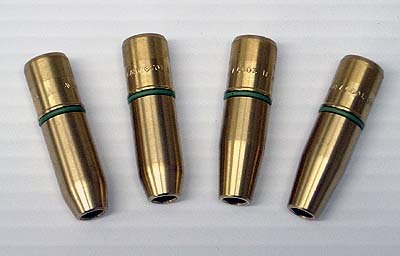 7mm guide seal, which HD introduced in 2004 on XL's and 2005 on Twin Cams, was a design improvement on their previous generation of .431 i.d. 5/16 stem guide seals. The larger diameter adds stability, plus the way the guide seal is held in place by the spring seat locater is a nice design that keeps the guide seal in place and stable. The design has a downside, however, in that shimming the valve springs moves the seal upward, which reduces retainer to seal clearance and pushes the seal up on the guide. The tall guide protrusion above the head surface also limits maximum lift. Applications above .600 of valve lift should use the Sledge Hammer series of parts.